Gardeners are always being made to cope with some disaster or another. If it isn’t rain, such as we have had virtually nonstop since March, then it’s impossible drought or hailstorms or drying winds or plagues of locusts. Weather happens; we must get on with it. So, despite a brief rain on Sunday (see previous comments about not working the soil when it’s wet), I made progress on my pathway garden. 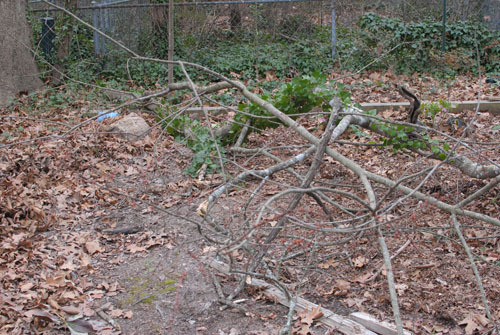 As before, I cleared the area–perhaps another 10 or 12 feet in length alongside the property-line fence–and hauled in soil amendments. This time, I treated the area to some moldering sawdust from the tree we removed in early May (in preparation for the house addition that it has been too damp to build), then a generous layer of the manure-grit mixture. 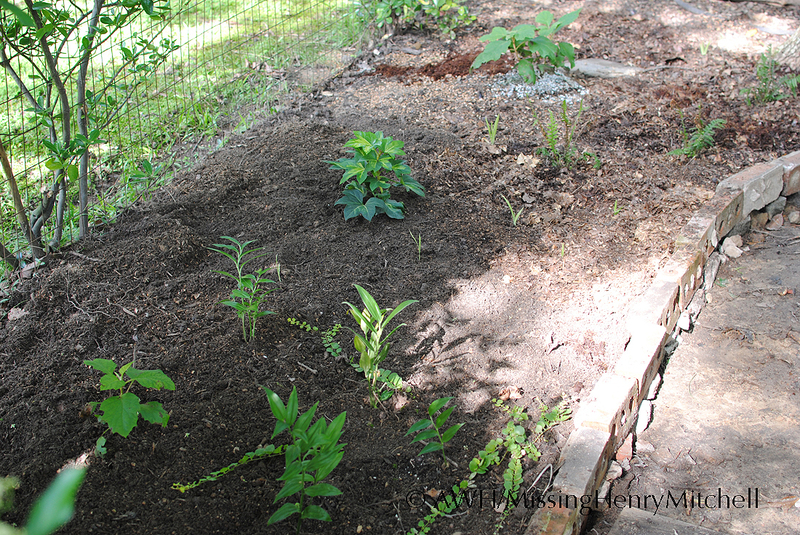 A careful till and smooth-over with the rake, laying and leveling the brick edging, and I was ready to plant. I installed another Hydrangea paniculata ‘Snowflake,’ a variegated Fatshedera lizei ‘Aureosomething’ (the tag, of course, is in the shed), perhaps two dozen or so displaced crocus and daffodil bulbs, and three Disporopsis perneyi, or Asian fairy bells. The Disporopsis were an impulse buy, a kind of horticultural checkout counter Toblerone. The evergreen foliage looks like that of Tricyrtis, another shade plant I love but which my voles apparently love more. I hope the Disporopsis‘s stiff vertical form will contrast nicely with the floppy, broad foliage of the hydrangea, and perhaps blend gracefully with the Fatshedera which I intend to cover the fence. As I mentioned before, in my mind it looks fantastic. And, hoping that very late is better than never, I transplanted some winter-sown seedlings of Anemone virginiana and Mitella diphylla. The pathway may prove too damp and shaded for the anemones but I expect this site is marginally better than the milk carton in which they were growing sitting. If they do want more direct light than they’ll get here, I’ll move them to the white garden, but that bed expansion is further down on the to-do list. The mosquitoes back there are the size of hummingbirds, I swear. 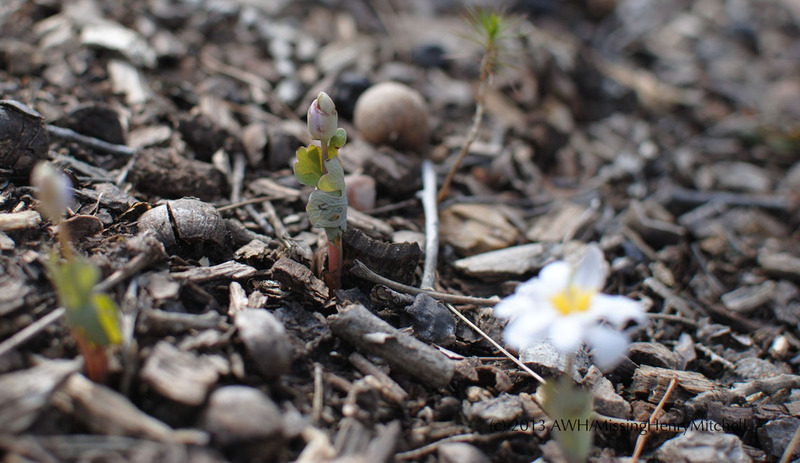 Write about one plant that is currently in bloom. 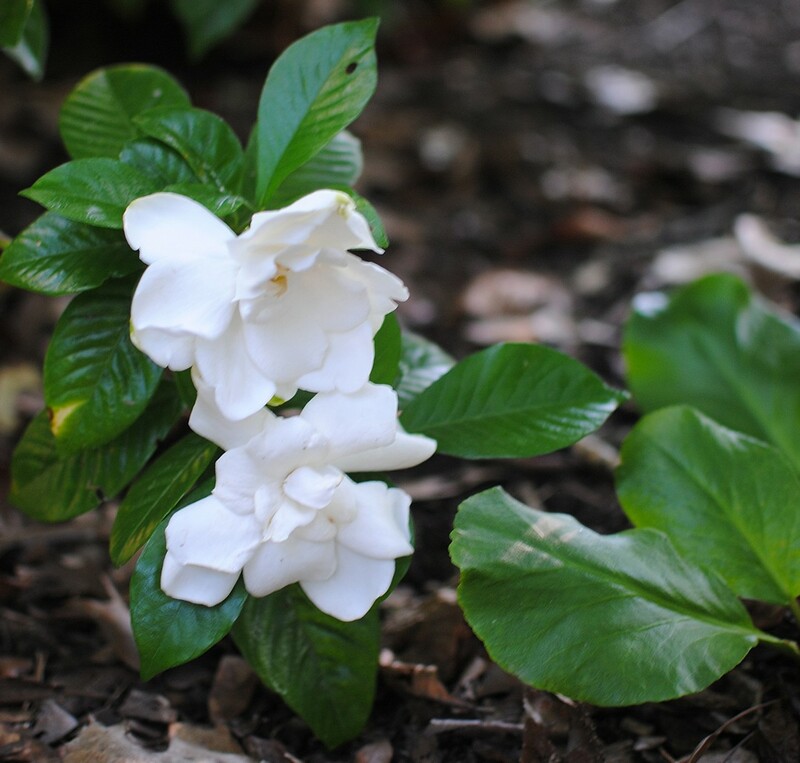 One of my favorite plants in the world is blooming now: the gardenia. When I walk into my garden, I smell them before I see them. Their scent is rich, redolent, sweet, but not overbearing. It invites me to take long, deep breaths, savoring the smell as I grow calmer and more relaxed. The flowers do not smell anything like a gardenia candle from a home store, or a gardenia soap or hand lotion; I don’t know if it’s possible to authentically replicate the scent of the flowers in the garden without somehow destroying that unexpected lightness that makes the scent so alluring. My gardenia hedge started out in 2005 as tiny things in 8-inch pots, as I recall. My sister, knowing of my keen interest in gardening and my keen lack of disposable cash given the young and expensive child in the house (didn’t those shoes fit last week?) and another on the way, told me: I have got a plant source for you. It’s a wholesale nursery, see, and they’re out in the absolute middle of nowhere. It’s two counties away. They don’t have a website and you can try calling them, but no one answers the phone and their answering machine is completely unhelpful. They won’t call you back. Nothing they have is labeled, so you’d better know what that plant you’re looking for looks like. But they’re cheap! It should be taken as a sign of my desperation that this seemed to me to be a worthwhile, even promising, venture. I drove an hour out into the countryside using vague directions provided by a friend of my sister’s (it is seldom advisable to embark on a journey for which your directions instruct you to turn left at the big rock). As promised, none of the plants were labeled. There were no helpful staff. I bought six gardenias and spent a whopping $18. I did, however, plant them in $100 holes (give or take $90). I had prepared a bed 10 feet wide and about 50 feet long. I tested the soil, amended it accordingly, dug in loads of leaf mold and homemade compost, all before I went shopping (this has never happened since). I planted the little shrubs about 8 feet on center, watered, and mulched generously. They took off like beagles on the scent of a rabbit. I recall getting flowers the next year, the buds so heavy they bent their branches to the ground like the ball on Charlie Brown’s real wooden Christmas tree. The hedge is now about 6 feet high, and even though the site is in deep shade for most of the afternoon (and light shade in the morning), the plants have filled in so that there are no gaps between them. They provide a beautiful, rich lime-green wall all year round. And every June (and again in August if I am lucky), I discover new blossoms each day. Their petals are like heavy silk satin; the blooms are the size of the palm of my hand. I cut fistfuls of them to bring inside; their perfume fills the house. 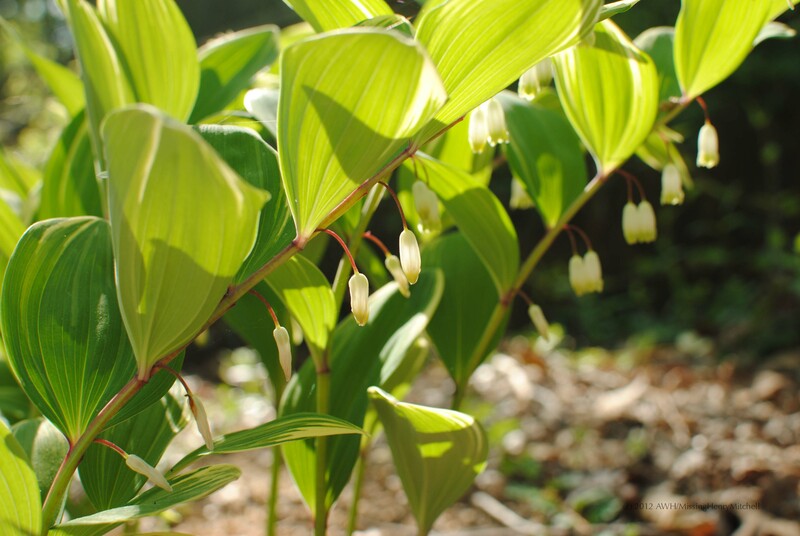 I dug up and moved the variegated Solomon’s seal, Polygonatum odoratum ‘Variegatum’. This is one terrific plant; absolutely resilient in my acid clay soil and deep shade. 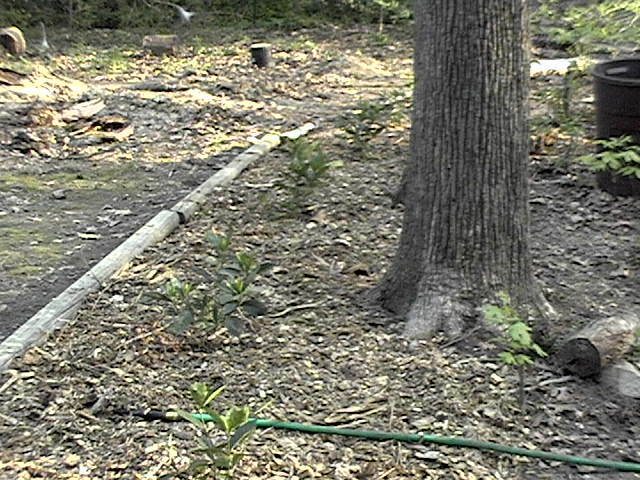 It had been located close to the azaleas I’m moving, but since that zone of the garden is being totally revised, I chose to move the Solomon’s seal to the under-construction white garden. Imagine the thrill I felt when I discovered the plant I bought in a 4-inch pot two years ago was now about 24 inches wide. It divided rather neatly into about eight clumps, which I planted near the Korean spice viburnum (Viburnum carlesii). Giddy from this accomplishment, I turned to the Acanthus mollis, sometimes known (but by whom, I am unsure) as bear’s breeches. This is a plant that I like in theory. I cannot say for certain whether I like it in practice, because for me it has never lived up to its billing. It has always been sited in what I consider to be part shade, getting afternoon sun (I’m sure it would prefer morning sun, like all other plants on the planet, but we cannot always have what we want). Instead of the 3′ clumps of spectacular evergreen foliage it is supposed to yield, I have 8″ clusters of spectacular leaves, if small, few in number, and in fact deciduous. It has never flowered. I made a last-ditch attempt to make it happy, transplanting it (in three pieces) to the edge between the white garden and the pink-purple-yellow garden, where it may receive, if not morning sun, then somewhat-earlier-in-the-day sun. I will consider it successful if it produces a larger clump of promising foliage. I will forgive its reticence to flower. I have heard that it is best to make the commitment to Acanthus at the nursery, because once you bring it home, you will never fully be rid of it. Not that it grows rampantly (clearly! 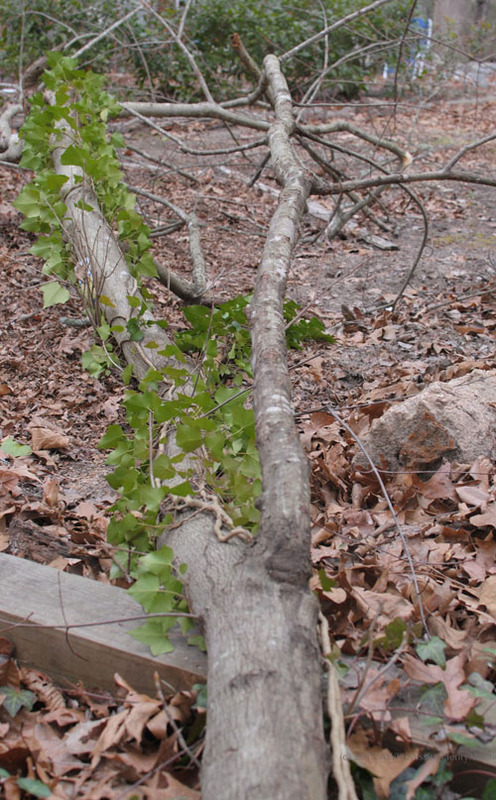 ), but the roots are rather brittle and will break easily. If a partial root remains behind, the plant will regenerate from it. I don’t normally show this much faith in a plant, but the leaves are truly irresistible. I was feeling a bit frisky this morning, so I cut down a tree. I don’t recommend this as a gardening task. For one thing, it’s tiring. For another, it’s easy to do a great deal of damage if you aren’t very careful. If you have any doubt about whether the tree’s too tall for you to manage, it is. Just call a reliable arborist (which I intend to do, soon, to do some canopy thinning, and to grind down the stump). This tree, though, was in the back (southeastern) corner of my property, was only about 6 inches in diameter, and perhaps 30 feet tall. I had plenty of space to bring it down, and if I may say so, I did it rather well: about 1 foot to the right of the new lilac and a foot to the left of the viburnum in the white garden. That kind of success doesn’t often happen, so I am taking the rare chance to crow about it. I am giddy today. Not only is it 65 degrees outside (I opened the windows in the house! ), but I have been given a packet of seeds of frost weed, Verbesina virginica, from Gail at Clay and Limestone. I can’t wait to try these. Gail promises it is a pollinator magnet. They’ll get a spot in my under-construction white garden, and I look forward to watching them this summer and fall. But perhaps their most remarkable effects are seen after a warm winter day and a cold winter night, when they create their astonishing frost blossoms. Gail’s photos will take your breath away. Work continues slowly on my white garden. Proceeding backwards to how one should, I am adding in the structural plantings after having put in a handful of perennials. A few weeks ago I planted 3-quart pots of Camellia sasanqua ‘Northern Lights’ and C. japonica ‘Morning Glow.’ ‘Northern Lights’ has a ribbon of pink around the edge of the petals, while ‘Morning Glow’ is pure white. The tricky thing with single-color gardens is that they can become quite static. One way of avoiding this is implementing lots of interesting textures and forms in the plant material, but when plants enter winter dormancy, it’s possible to lose this dimension. So incorporating small tinges of color can help the primary flower color pop. I’m hopeful this will happen with the pink fringe to the petals; from a distance, it probably won’t register at all. Still looking for some additional evergreen structure. In my winter sowing experiment, I’m going to try Magnolia grandiflora (or what I think is Magnolia grandiflora). 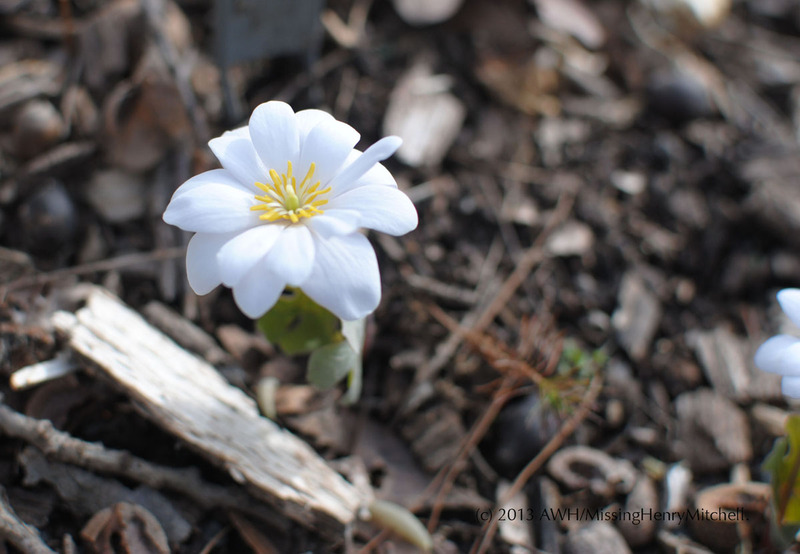 My mother found the plant, about 24″ high, growing in the woods on the edge of her property and transplanted it into her garden, where it’s effectively doubled in size every year for the past four years. I’ve got a handful of its seed pods and I shall see what happens. Assuming it works, in order to actually install one in the garden I’m going to have to remove an oak tree that gives me the shivers every time I see it; although I’ve been assured it’s healthy, I’m convinced that it’s going to drop a giant limb in my neighbor’s yard. Have I mentioned it’s a very ugly shape as well? Also thinking about Sciadopitys verticillata, or maybe a nice Podocarpus. I love yews, but I think I’d be asking for deer problems. Maybe once I get a fence put in (keeping with the theme of working backwards…).